Time flies when you’re having fun or when you are simply living your life as quietly as possible hoping for the best. Another Tiny Tiger’s graduation was upon us. 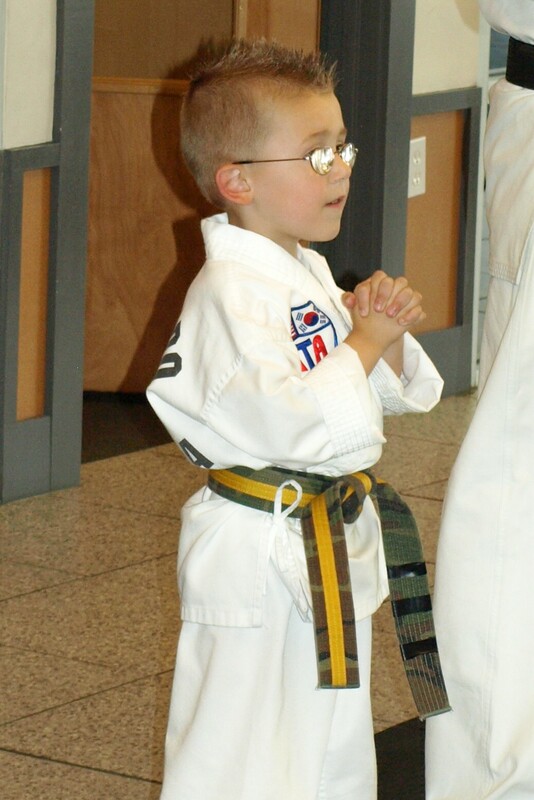 T.Puzzle has struggled to break the necessary board to advance his belt. Full Speed asked permission from the instructor to help hold the board for T.Puzzle. That was the highlight for me; watching Full Speed want to be the ‘big brother’ for T.Puzzle. After what seemed like 87 million attempts (all of them failed), T.Puzzle could not break the board. 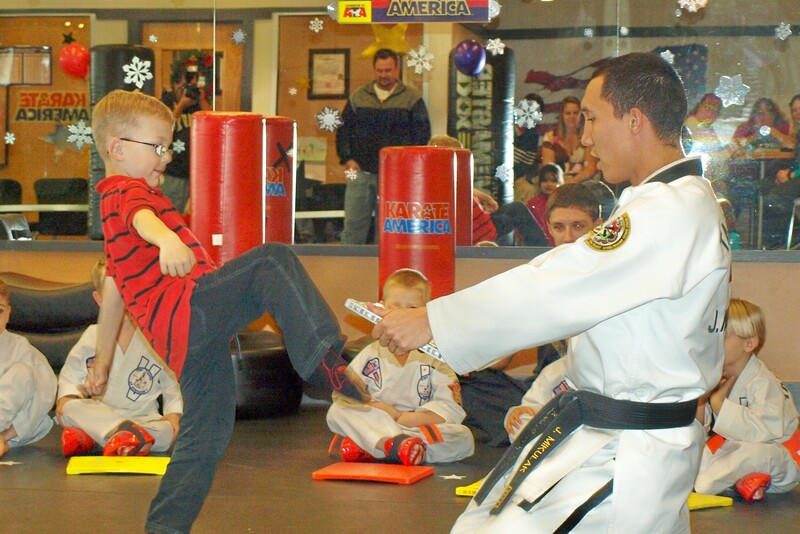 The instructor asked Full Speed to step in and break the board on T.Puzzle’s behalf. Eventually, T.Puzzle was allotted some more attempts as graduation was ﻿﻿﻿winding down. He kind of sort of broke it on his own accord. 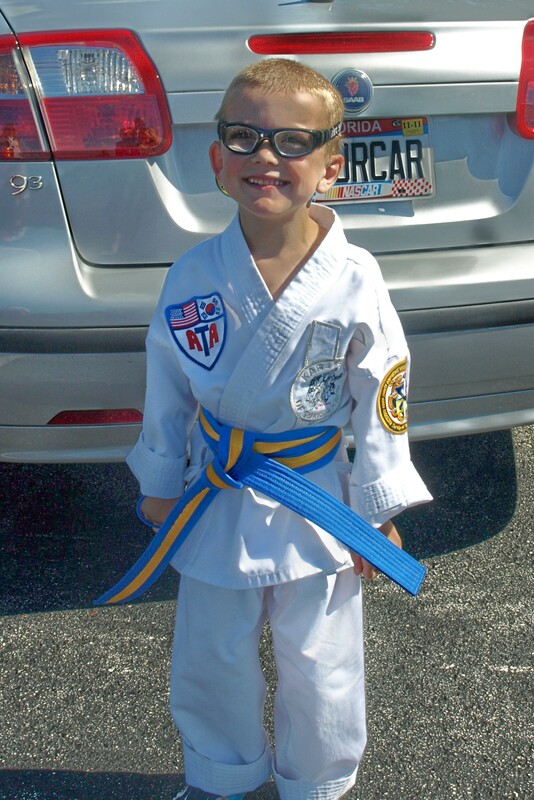 He earned his new belt and the pride spread across his face from ear to ear. 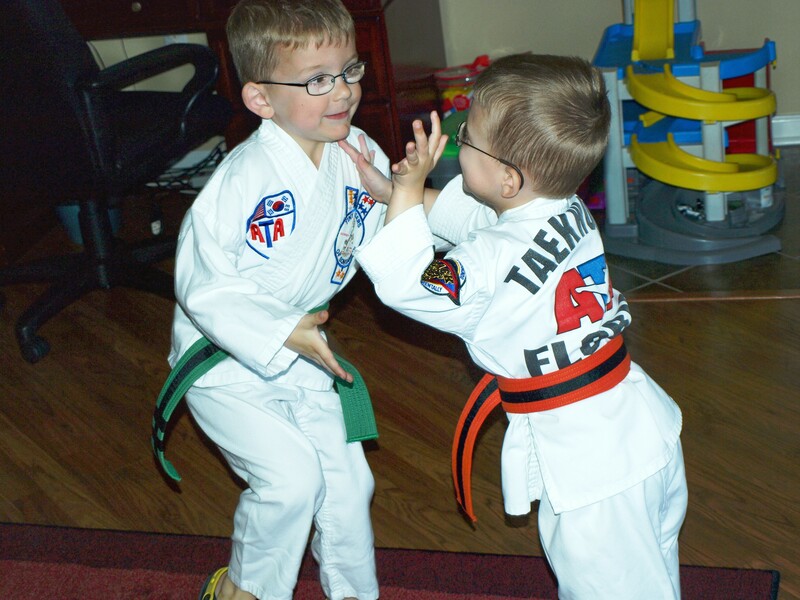 It’s great to earn a new belt, but even better to have a brother who’s got your back. 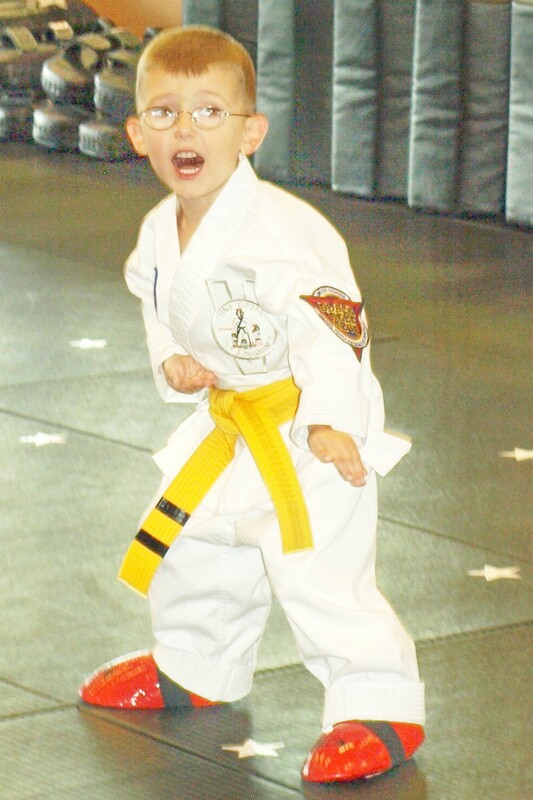 Mad Dog has taken the boys to tae kwon do practice two days running. I have whole-heartedly enjoyed the reprieve. As they sauntered out to the studio Full Speed was shocked that Mom was staying behind. I didn’t want to share that my plans consisted of a whole lot of nothing. I had a hot date with my Redbook magazine and XM Radio holiday traditions, baby. “Well, Mom, I guess you are going to the Motherland to rest and relax,” he decided. I love that he coined this new term and acted as if we use the word ‘Motherland’ in casual conversation all the time. That’s when it dawned on me. I need to create a Disney-like complex dedicated for Moms only. There would be kiosks of cocktails and stores full of fashion and shoes. Instead of rides and attractions there would be spa treatments and chocolate tastings. It would have fantastic lighting that would flatter the face and a perimeter flanked with mirrors that when looked in, would reflect back a slimmer silhouette. We would all feel beautiful, loved and appreciated. I’d even open the doors to anyone who is a caregiver in any capacity. Daycare teachers, Grandmas, nurses, friends, etc. would all be welcome. Oh, T.Puzzle. There were times when I was nicknaming you for this blog, that unfortunately words like shark and razor tooth were at the top of the heap. As I went through the catalogue of your gifts and idiosyncracies, a fascination with using your chompers for evil was a strong contender for possible names. So happy I went the puzzle route instead. We all dream our children will find their passion. We hope they excell at whatever they choose to endeavor. One of T.Puzzle’s favorite endeavors is to bite his brother. It didn’t start out this way. He used to bite about anyone or anything in his path. I told you he was gifted. Thankfully, except for the rare attempt here and there on innocent bystanders, he now seems to mostly isolate his attacks on Full Speed. Is it bad that I’m secretly grateful he is only biting his brother? I feel if he keeps it in our family there’s less chance of a lawsuit. 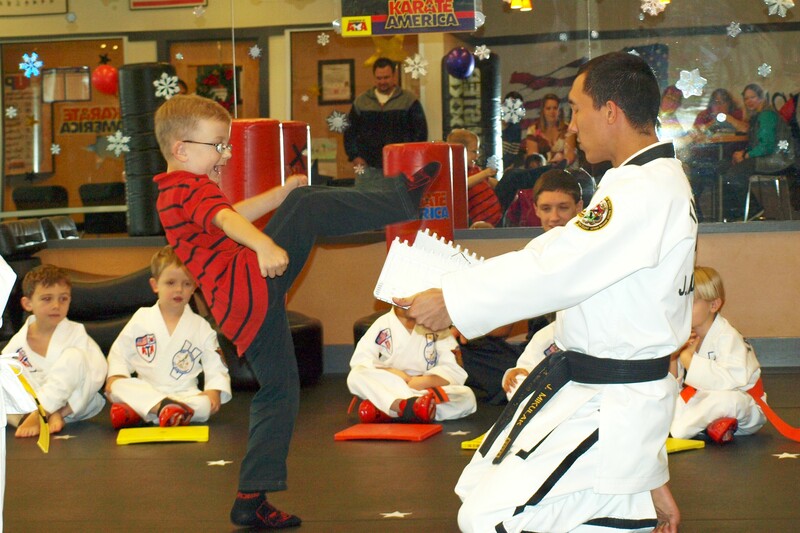 I wrote an extremely unfavorable behavior report for tae kwon do about his recent double-biting-brother escapades over Thanksgiving break. “First, let’s commend little Bobby for helping his sister with the dishes,” exclaimed the instructor as he rattled off the first exemplary behavior report. “Wow, great job to little Jenny for being polite and using her manners,” he continued. It went on and on. One after the other did something more extraordinary than the student before him. we got to T.Puzzle and his report of biting doom. And this was when my other dream of having a child stand out in a crowd was fully realized. Maybe it’s time to start shopping around for some new dreams. It was Full Speed’s turn to graduate. 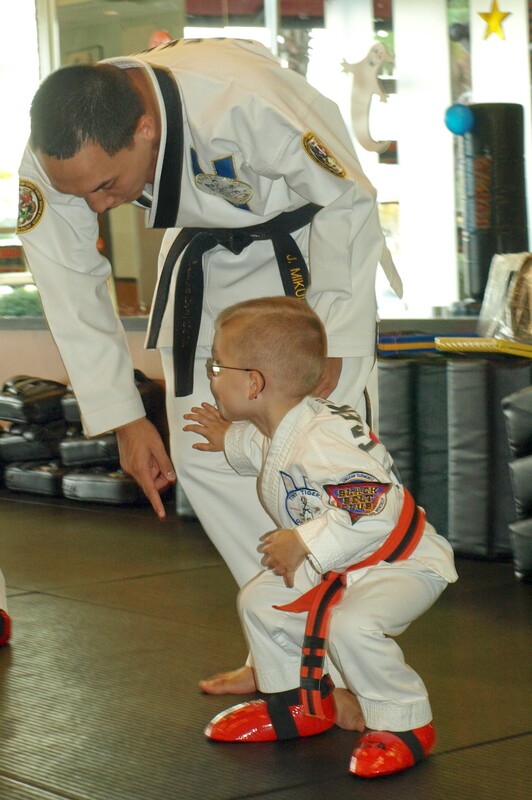 I have less reservations about his involvement in tae kwon do because since the age of three, he has taken to it like a fish to water. I figure there can’t be any real lasting damage if the kid is having a blast. As for the adults viewing the nearly two and a half hour long graduation spectacle, I don’t think we fared quite as well (my apologies to Grandma and Grandpa for the extreme time commitment, on a Saturday no less!). Apparently, we got off easy. Previous graduations for juniors and above have clocked in at five hours. 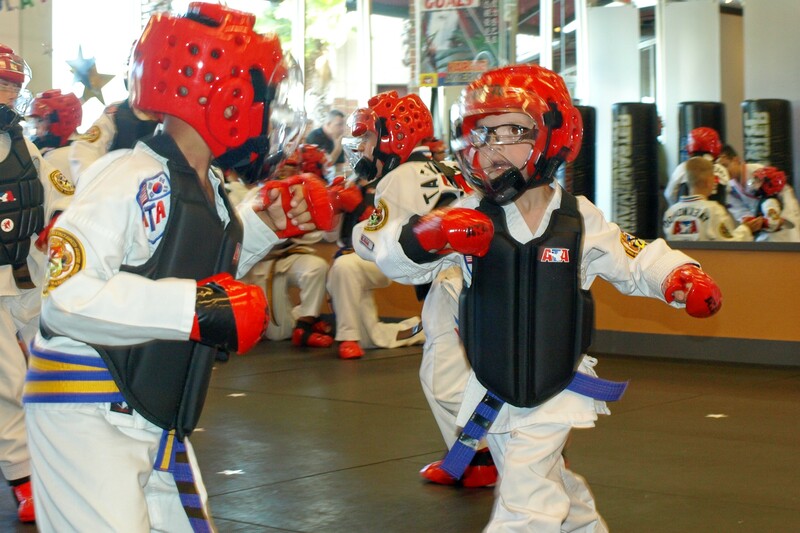 Full Speed in attack mode as he spars for his belt advancement. Despite all this, we enjoyed watching Full Speed perform his forms, kicks and punches. 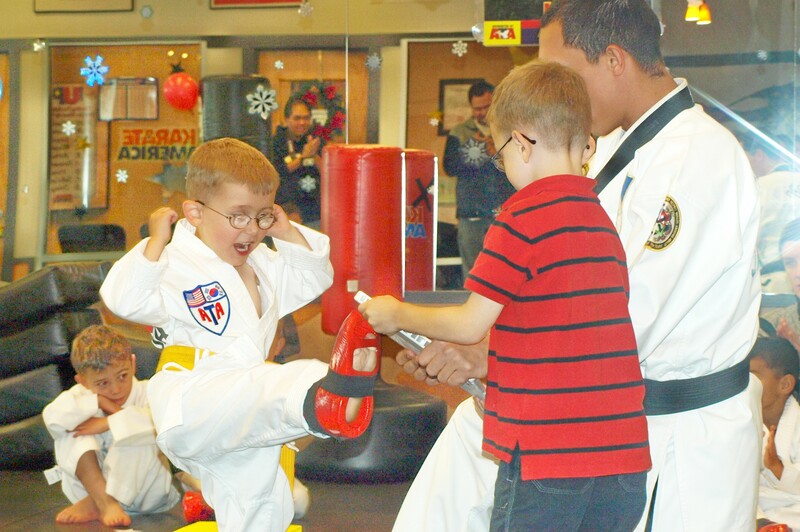 He sparred like a champ and showed great attention and focus. As for me, I showed great attention and focus, but only when Full Speed was on the mat. The rest of the time I too, dreamed of pizza (and shopping, and reading and birds and the meaning of life, pretty much anything except tae kwon do). 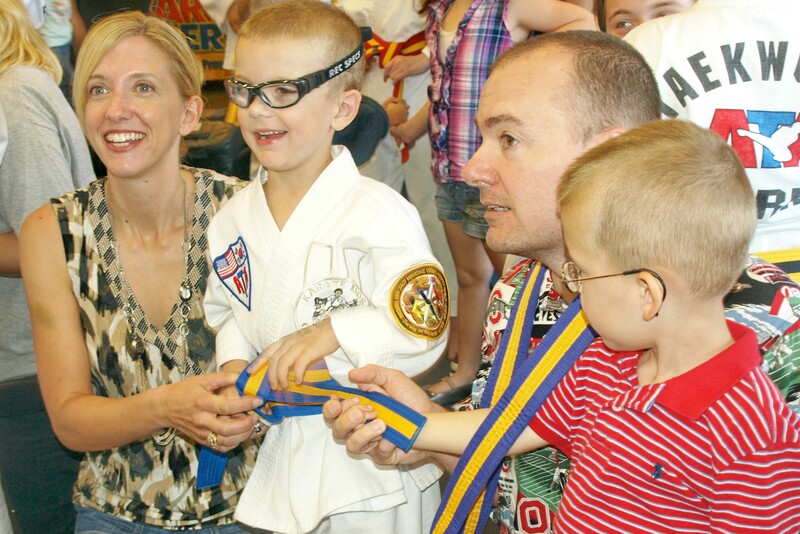 We join him on the mat for the belt tying ceremony. Way to go Full Speed!